Is Apple’s browser lord of the beasts, or does it need to be culled? We've always found Safari frustrating, in that it's full of potential, but always manages to fall short of being great. And so it goes with Safari 3.1, although this release at least continues the browser's agonisingly slow crawl towards its superior contemporaries. As with previous versions of the browser, Safari's user interface is its biggest draw. Improvements to tabs now make Safari's implementation industry-leading in terms of intuition, making it simple to rearrange tabs or drag them out of the Tab Bar to create a new window. Usefully, double-clicking the Tab Bar now opens a new tab. Small tweaks elsewhere show that Apple leads when it comes to user-interface niceties, for example, form 'textarea' fields are completely resizable. 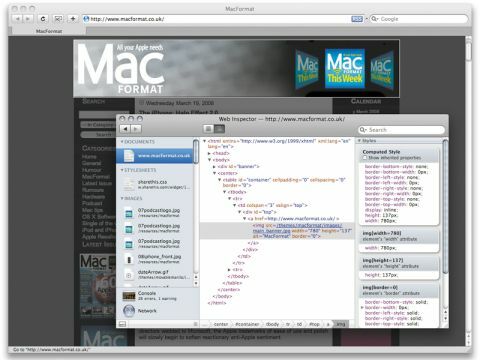 Although generally considered a browser best suited to newcomers, Safari finally makes a concession to web designers. The new Develop menu provides access to handy tools for inspecting and disabling web page elements. Sadly, Safari still falls short of the likes of Opera and Firefox in a few important areas. While Apple's in-page search is great, we wish it used industry-standard shortcuts. Also, the continued lack of built-in ad-blocking and keyword shortcuts is beginning to grate, and while upgrading the browser from 3.0 to 3.1 proved painless, Apple should stop adding unwanted junk to the Bookmarks Bar.